We started our software development apprenticeships at the SFA in September. 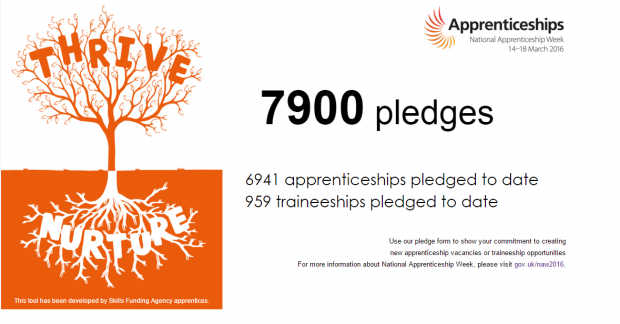 One of our recent projects was to create the National Apprenticeship Week Pledge-o-meter application from scratch. The Pledge-o-meter allows employers to register their commitment to taking on apprentices and trainees. We both had programming knowledge already, so didn’t need any formal training for this project. If we needed to know anything new, we taught ourselves as we went along and asked for guidance when we needed it. We ran the task as an agile project with four sprints, each lasting two weeks. This was fitted around our apprenticeship training courses. During the sprints we had regular meetings with the communications and marketing team to establish what content was needed, review what we had developed so far, and identify any changes required. The most difficult part of the project was clarification of specification. This was because may different teams were involved in or interested in the project, and sometimes there was disagreement about whether a particular feature was essential or just “nice to have”. Having regular meetings with different stakeholders and making sure there was good communication, helped to resolve any issues. Working in the SFA and on this project has shown us that there is always something to learn, whether that is business or technical knowledge. At first it was quite surprising for us to see experienced developers researching to find solutions to their conundrums, but now we’re learning to do the same. This project has improved our coding skillset, especially our knowledge of using Web Forms. Working independently has increased our ability to research efficiently to improve our skills. There's is not always someone available to provide guidance, or they may not know the answer themselves! It was good to be placed on this project quite early within our apprenticeships. We were given real responsibility for managing the progression of the project, organising meetings, and communicating with colleagues from other areas of the SFA. The best part of the project was the sense of being valued within the team and organisation.